The USB Pro Drum Kit is designed for USB/MIDI performance with your Mac, PC, or other MIDI device. 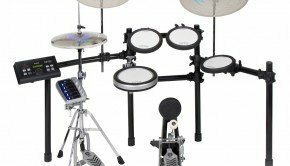 The USB Pro Drum Kit features dual-zone RealHead drum pads, genuine alloy SURGE Cymbals, and a compact, studio-friendly StealthRack drum rack. 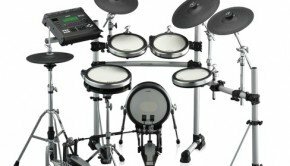 Harness the powerful processor in your computer to create incomparably realistic electronic drum tracks. USB Pro Drum Kit is the world’s first drum set designed to use your Mac or PC as the sound module. Your computer has more processing power than any hardware drum module, and USB Pro Drum Kit makes harnessing that power easy. The true touch of real, tunable, mylar drum heads, combined with the natural feel of brass-alloy SURGE Cymbals creates an acoustic-feeling, great-sounding drumming experience. Just plug the kit’s Trigger|iO interface into your Mac or PC’s USB port, load up your sequencing, recording, or virtual instrument software, and you’re ready to play. Because the USB Pro Drum Kit is MIDI compatible, you can track a performance, and then go back afterward and tweak your sounds. Try that with acoustic drums! The USB Pro Drum Kit also opens up a new world of software including BFD, Toontrack, and Reason to drummers and producers looking for realistic drum performances. 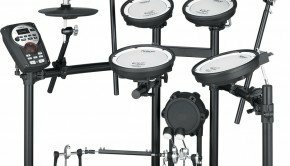 The USB Pro Drum Kit’s acoustic-feeling RealHead drum pads are built around 8” mylar drumheads and acoustic-dampening foam for quiet response. The snare and tom pads are dual-zone, enabling rimshot or rim-click sounds on the snare and additional sounds such as wind chimes, cymbals, gongs, and cowbells on the tom rims. When they wear out, the drumheads can be replaced with any model you choose from any manufacturer. The heads are tunable with a standard drum key for adjustable tension and feel. The triple-flanged counterhoops are covered in removable, sound-reducing rubber sleeves, which further cut acoustic noise. 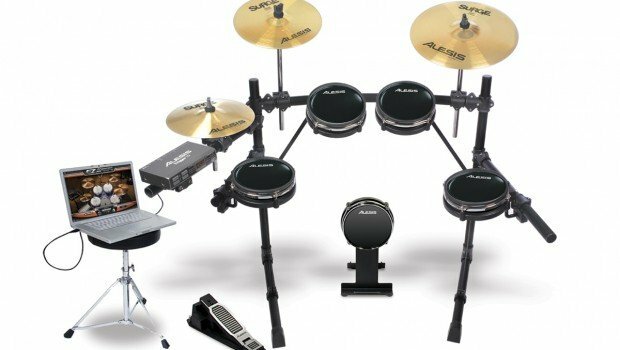 The USB Pro Drum Kit includes a self-standing RealHead Kick Pad with stand, to which any model of single or double-bass-drum pedal can be attached. The kick pad also features a tunable, 8” mylar playing surface. The USB Pro Drum Kit comes with SURGE Cymbals, the only serious choice in cymbals for triggering electronics. The kit comes with a 12” SURGE Hi-Hat Cymbal, a 13” SURGE Crash Cymbal with choke, and a 16” SURGE dual-zone Ride Cymbal with choke. These alloy cymbals are coated with a clear sound-dampening layer so they feel like acoustic cymbals! The Crash and Ride cymbals feature large choke strips on the undersides for even more attention to accurate cymbal control. The Ride features dual-zone triggers for bell-clanging nuance. And the SURGE Hi-Hat Cymbal is continuously controllable using the included RealHat Pedal. The fully adjustable, compact StealthRack is built of 1 1/2-inch metal tubing, which is standard throughout the drum industry. It’s easy to expand the USB Pro Drum Kit with any manufacturer’s clamps and mounts. All necessary clamps, professional 1/4-inch cables, and mounting hardware are included. All clamps adjust with the included drum key. Pad-mounting L-arms feature non-round arms to eliminate slippage from playing. All of the hardware on the USB Pro Drum Kit is designed for sure grip and extensive adjustability. No other drum set blends the realistic feel and touch with the sonic and creative flexibility of the USB Pro Drum Kit.